Learn about the different tea regions of Shizuoka, the main tea growing region of Japan. Each region has unique topography, climate and tea cultivation focus. We were fortunate to have been invited to Shizuoka by the Japanese tea organizations to visit and meet a number of tea farmers. This video was presented to us as part of our visit. This Bing Cha factory video is from one of our sourcing trips in the early, start-up years as a tea company when we were auditing new suppliers. It is a visual landscape from a tea factory near Menghai in Southern Yunnan specializing in making round tea cakes (Bingcha). The visuals include the sun drying of the cakes and also on indoor wooden racks. In shaping the cakes, the leaves are first steamed and then put into cloth sacks and finally molded with stone weights. One of the only specialty tea factories located in the Nilgiris. We work closely with this project based in Coonoor making green and black, full leaf specialty teas. A photo travelscape of our trip to Xihu and Dongting lake. The areas are famous for Dragonwell and Biluochun green teas of China. Banzhang in Xishuangbanna is one of the highest elevation old growth tea forests. The tea tress are several hundred years old and home a village of 150 families. We took this video on our visit there. Follow the tea pluckers who comprise a native minority community of the region. The region of Xishuangbanna in Southern Yunnan, China is regarded as one of the birthplaces of tea. It is home to the oldest old growth tea forests (several hundred years old). The region’s biodiversity and ethnic minorities are true stewards of the ancient tea customs and culture. The Tao of Tea sources teas directly from these communities. Yixing clayware, also known as Purple clayware is word famous amongst tea lovers for the variety of clay materials and artisanship. This video was made after our last visit to the town of Dinshu in Jiangsu province in China. View a tea garden in the Nilgiris, South India. Nilgiris are also called the ‘Blue Mountains’ of India and famous for the lush, green tea gardens. The video is made by a friend of ours Indi Khanna who is resident in the small town of Coonoor in the Nilgiris. Indi has spent the last 25 years in the tea industry in various roles. We enjoy working with him in different tea related projects. Darjeeling First Flush. Veerinder, Founder, The Tao of Tea visits the oldest tea factory of the region to select his micro lot of the new season. The tea garden is at the edge of India and Nepal. Located in the Mirik valley of Darjeeling, the estate is nestled on the banks of the river Mechi, at an altitude ranging from 1770 mtrs to 2360 mtrs. Okayti tea estate is spread across 608 hectares. The garden was first planted in 1888 and has been owned for generations by the Kumbhat family. We are great friends with Antrishk, who heads the garden now. He keeps us high on the list of buyers given teh option to purchase the prized micro-lots. The estate is known locally as ‘Rangdoo’. The sound quality of the video is poor due to the high winds in the area. The name Biluochun literally means “Green Snail Spring”. It is called so because it is a green tea that is rolled into a tight spiral, resembling a snail and is harvested in early spring. Its original area of cultivation is the Dongting mountain region near Lake Tai in Jiangsu province, China. The fresh green tea leaves are roasted in a small wok, with precise rotating hand movements to bring the leaf into a curled shape. Crafting Sencha green teas by hand is a time consuming artform. It is becoming more difficult to find artisans that do this process. Mechanical processing has become the norm in Japanese tea making. View this old artform to get a glimpse of the expertise and heart required to make well crafted tea. We visited Shizuoka, Japan in the recent past and met the head of the Shizuoka tea farmers association. At his humble abode, there was small table to craft Sencha by hand. The surface of the tea table is made of paper and is gently heated from below. Precise hand movements are needed in a repetative motion to enable the tea leaves to develop aroma and taste. The whole process by hand takes several hours from start to finish. Traditional Chaiwalla at an Indian Party in New Delhi, India. Serving authentic Chai in classic clay cups. The Chai is kept warm over charcoal fire. Guests can be seen getting into a ‘chai-drink’ state. 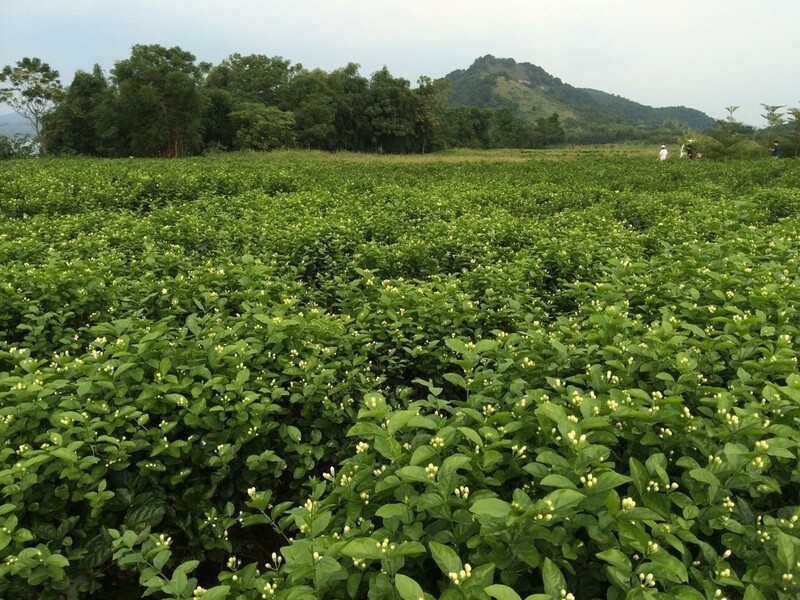 Veerinder providing insights on Phoenix family of teas in Guangdong, China. On one of our trips to Fenghuangshan (Phoenix Mountains) in Guangdong, China. We were invited in by one of the local tea farmers in Wudong village for a cup of tea. This particular farmer is well known for crafting Phoenix oolong teas from old age trees growing near Wudong. His humble home had basic but all that was really needed as equipment for making tea. Evonne from The Tao of Tea enjoys a cup of long-leaf Phoenix oolong in a Gaiwan style brewing and shares some tea humor with the farmers. View of Andong Moungtain in Cangyuan, Yunnan at the border of China and Burma. Some of our organic teas (Tippy South Cloud, Lincang Maofeng Green, Puer Tuocha and Shou Pu Bing Cha) come from this area. Home to two remotely located tea areas known as Mengla and Mengku. The area is remotely located and takes considerable time to get there from the nearest big city in Yunnan. There were strong winds on the day we visited, and you will note that sound in the video. With so many teas on the market, have you ever wondered how to distinguish between the various grades of tea? What sets a top notch Jasmine tea apart from a mediocre one? Read our Quality Guide to Jasmine Pearls to gain a sense of how the tea is made and what to look for when selecting your next loose leaf Jasmine. In its fifth consecutive year, a month long celebration of tea and the art forms associated with tea drinking and tea culture, both historical and contemporary. 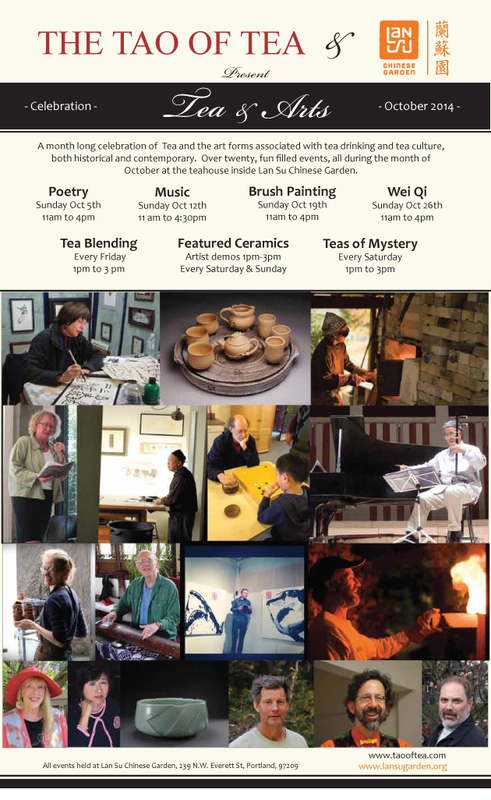 Over twenty different fun filled events, all during the month of October at the Teahouse & Lan Su Chinese Garden. Tea from a remotely located tea garden in Lincang county, Yunnan, China at the border of China and Burma. The mountainous landscape is home to few, but prized tea gardens. Due to their remote location, it is difficult to hire tea pluckers there. As such, the tea plants are not heavily pruned and have taken on a semi-wild character which gives a pleasant flavor profile that is low in astringency. It took us over a day of driving from the nearest major Chinese city to get to this tea garden. The Tao of Tea is the only U.S based tea company to be able to source tea from this garden. Oolongs undergo a variety of rolling techniques. In the case of twisted leaf style, a simple rolling machine is used wherein, the base is heated. With light pressure, the leaf undergoes a rolling technique that brings the leaf into a loose twisted style. The tunnel roaster is an integral part of the oolong production process. The roaster rotates while the tea leaves are heated and roasted at the desired temperatures. The leaves are routinely taken out by tilting the roaster, then cooled, rolled before roasting them again. The Oolong ball rolling technique requires packing the tea leaves into a cloth sack (ball) by hand and then utilize a machine to tighten the pressure. The steps are repeated several times, before the leaf assumes a rolled leaf shape. Traditional rolling techniques used to be done solely by hand and these days a small machine is used by most oolong crafters. Sorting tea by hand using different mesh sizes of sieve. This farmer is based in Shizuoka, Japan and uses the hand sorting method to create a standard for referencing his production batches. Local farmer harvesting tea leaves in Southern Yunnan, China. Very few old growth tea areas remain in the world today. This tea tree is several hundred years old. The new shoots are quite staunch and need a sharp sickle to cut them, rather than being able to pluck with fingers.